I have exported an item to Xero but it's not showing up in drafts, how can I find it? 1. 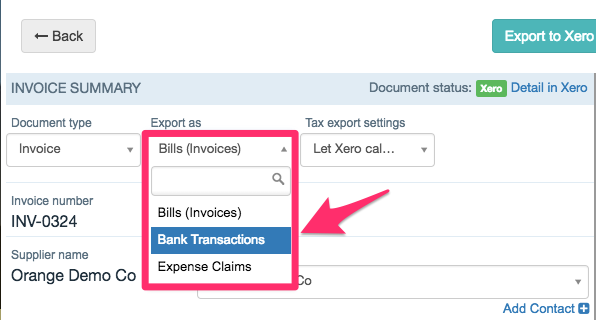 The quickest way is to click on the 'Xero sign' button inside your invoice. This will direct you right into this invoice in your Xero account. 2. Another option is to check 'Approval status' setting in the Supplier Automation dashboard and search for the invoice in Xero based on the status selected in the Supplier Automation. If any of the above steps don't help, please check the export destination setting inside your invoice. If you export document as 'Bank transaction' or 'Expense claim' it will not appear in 'Drafts'.